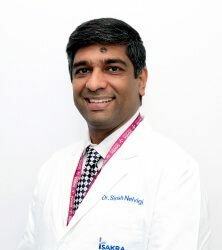 Dr. Sandeep S. Patil the Ophthalmologist at Sakra World Hospital – Bangalore, belongs to the new breed of Ophthalmologists of this decade. His vast exposure to the newer generation diagnostic machines and methodology goes hand in hand with his passion for Ophthalmology. He has rich experience of working for many Multispecialty Hospitals and before Joining Sakra World Hospital he worked as "Consultant Ophthalmologist" at "Vasan Eye Care". He has completed his Post Graduation from one of the oldest and Prestigious Institutes for Ophthalmology – JJM Medical College in Karnataka. He has also done his training in basic diagnostics at the LVP – Zeiss International Academy of Advanced Ophthalmic Education at the premiere "LV Prasad Eye Institute Hyderabad". He has completed his training / fellowship in Phacoemulsification (Cataract Surgery) from the prestigious BWL Eye Hospital. Successfully completed Retinal Preceptorship Program at Shankara Nethralaya, Chennai. He has actively participated in many CME's & Workshops across India. He is a lifetime member of "All India Ophthalmic Society" and a staunch participant at the State & National level conferences and CME's. Medical Retina ( i.e. Mgmt. of Diabetic Retinopathy, Vascular occlusion in Retina, AMD including Intravitreal injections & implants).